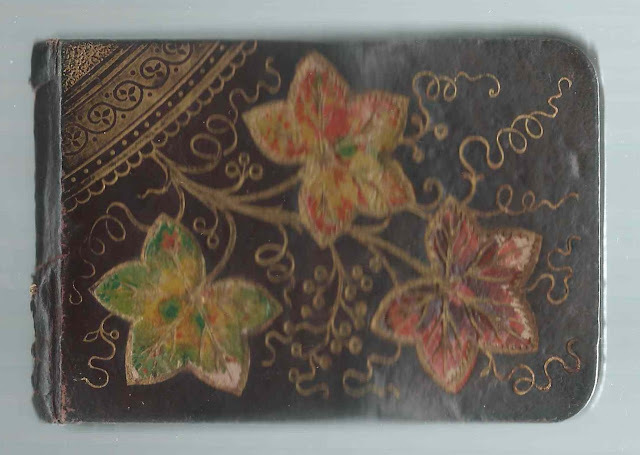 1882-1886 autograph album that belonged to Annie B. Wildes of Bath, Maine. It was presented to her in New York in 1882 by her father, Alonzo Parsons Wildes, while they were on board the Schooner C. H. Haskell. 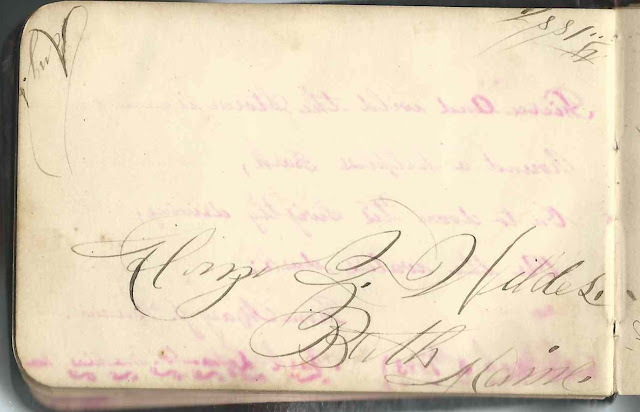 Several of the pages have a facing page with information on the signer, by a more contemporary hand with an apparent relationship to Annie's younger brother Alonzo Foster Parsons. Below, the facing page to the presentation page shown above. The album is a small one, measuring about 4-1/4" by almost 3", and is seriously warped; some of the images show poorly as a result of this warp. At least 40 people left sentiments; Annie's brother Alonzo may have left two, if his nickname was Lornie or Lonnie. An alphabetical surname list and an alphabetical list of the signers appear at the end of this post. Some of the signers in the album identified themselves as Sea Captains; there may be more - check the list of signers below. Two people, possibly three, mentioned a word on the page that might have represented a vessel, such as Scud and David. Joshua Bartlett of South Thomaston, Maine, on the Schooner Ada F. Whitney at Pensacola, Florida, who signed his page on March 4, 1883; the Ada F. Whitney would be lost off North Carolina on September 22, 1885, with no lives lost. Joshua's wife Abbie S. (Emery) Bartlett signed the right facing page. Annie B. Wildes was born September 18, 1866 at Bath, Maine, the daughter of Alonzo Parsons Wildes and Ann Eliza (Bowker) Wildes. 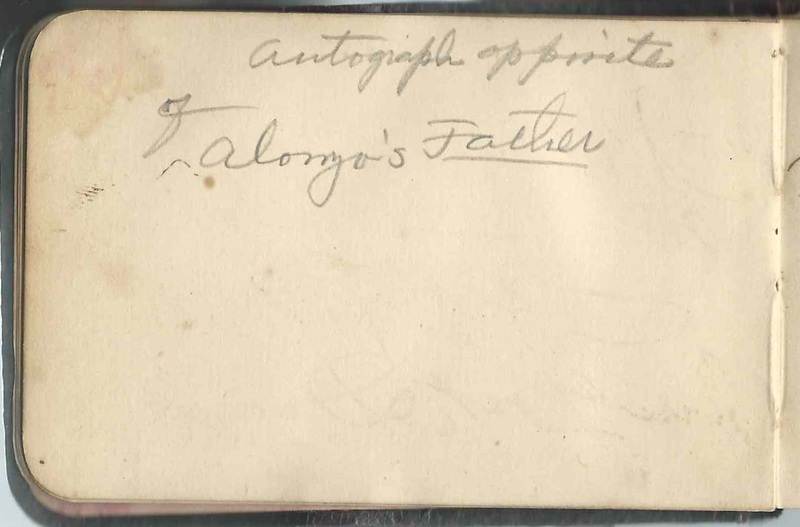 In addition to penning the presentation page, shown above, Alonzo Parsons Wildes inscribed another page in the album. The more contemporary hand filled in the left facing page with more details. Alonzo Parsons Wildes was presumed lost at sea in March 1886. It was determined that it was mostly likely his vessel, the Charles H. Morse, that collided with the Cunard liner S. S. Oregon about 15 miles from New York City. The unknown schooner sank without a trace. The Charles H. Morse, which was presumed to be in the same locale, was never heard of again. 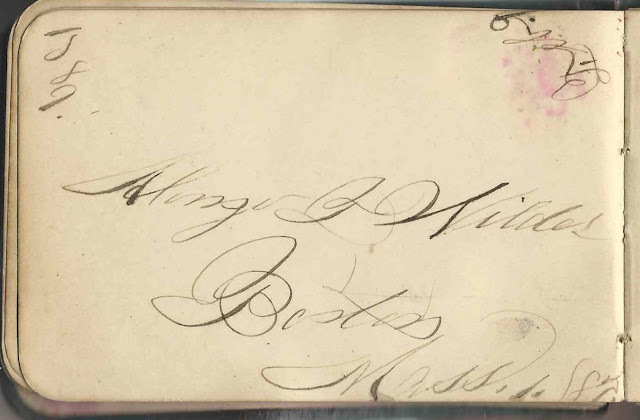 Annie's mother Ann Eliza (Bowker) Wildes inscribed a page in the album at Bath, Maine, on July 29, 1883. She was the daughter of Isaac Hall Bowker and Eliza (Bowker) Bowker. Annie's younger brother Alonzo Foster Wildes signed two, possibly three, pages: at Bath, Maine, in 1881; at Boston, Massachusetts, in 1889; and possibly, if his nickname was Lornie or Lonnie, on July 29, 1883; though perhaps Lornie was the child of a relative, as the handwriting seems younger than that used in 1881. 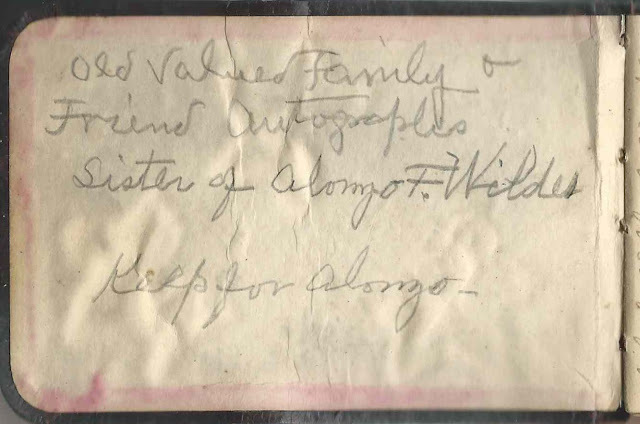 Though the middle initial on the top two images is hard to read as an F., the handwriting is very similar, and one of them was signed after Alonzo Parsons Wildes' death. I found a reference online where it was at first feared that Alonzo Foster Wildes had been on board the ill-fated Steamer Portland, when it sank in 1898. However, that must have been in error as he lived until 1944. When middle-aged, he married Mary Bellamy Safford, of a prominent family from southern Maine. They settled at Kittery, Maine. 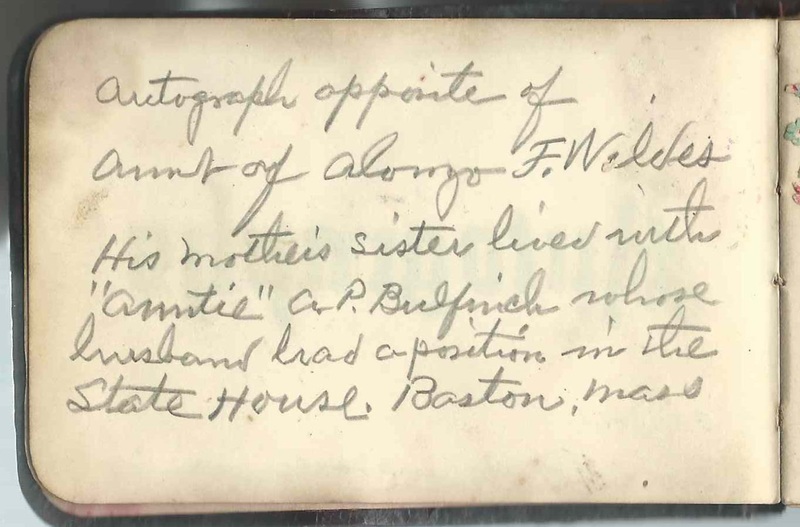 Interestingly, a page signed by Aunt Ella P. Foster of Boston, Massachusetts, has a companion facing page in the later handwriting that explains what happened to Alonzo Foster Wildes after his father died. "Alonzo's Aunt Ella Bowker Foster opposite. Alonzo lived with her after his father was drowned for a while. I think he was about 15 years old. Later he returned to Bath, Me. to be with his mother." Ella Jane Porter (Bowker) Foster was the wife of Daniel Kellogg Foster and a sister to Ann Eliza (Bowker) Wildes, Annie's mother. 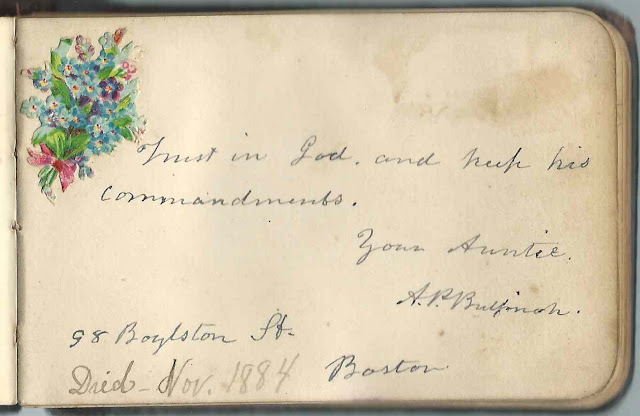 Another aunt, Annie P. (Bowker) Bulfinch, signed at page at 98 Boylston Street, Boston, Massachusetts; a later note indicates that she died in November 1884. She was Annie B. Wildes' great aunt and was the second wife of Francis Vaughan Bulfinch, as information on the facing page describes: "Autograph opposite of Aunt of Alonzo F. Wildes. His mother's sister lives [or lived] with "Auntie" A. P. Bulfinch, whose husband had a position in the State House, Boston, Mass." 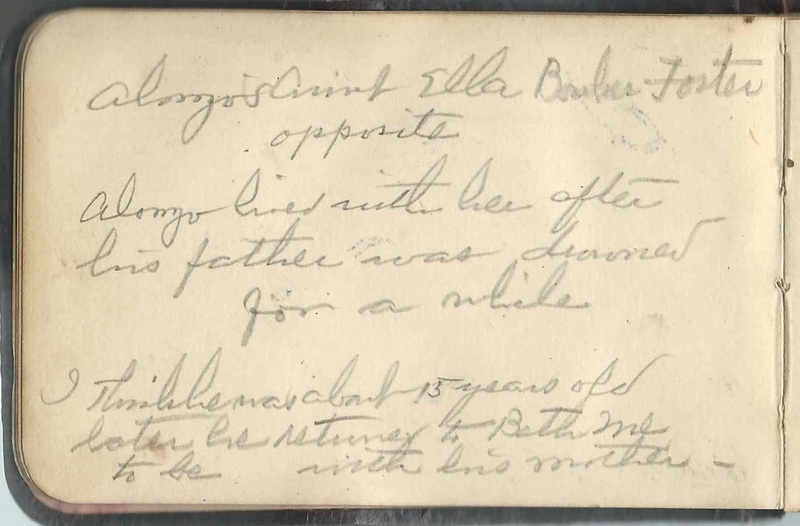 The "mother's sister" may have been Ella P. (Bowker) Foster, mentioned above. 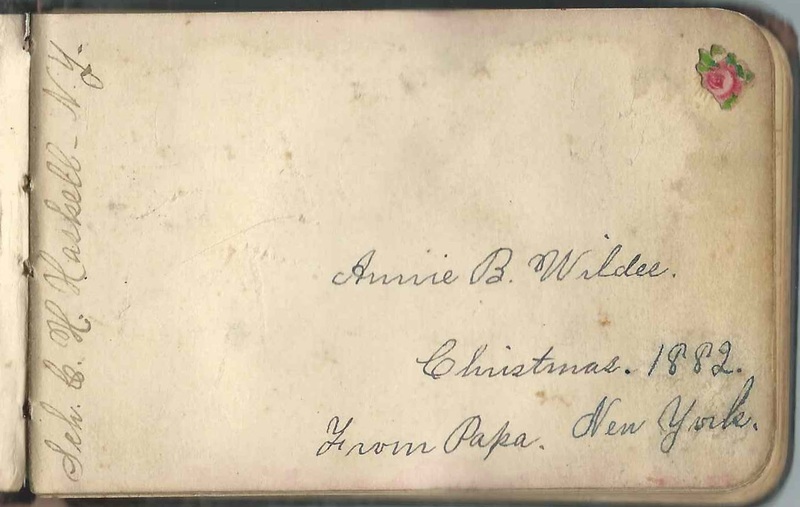 Several of the autographs from Arrowsic, Maine, indicate that Annie B. Wildes was teaching there in October of 1886, after her father's loss. On the page Maud Rairdon inscribed on October 4, 1886, she called herself Annie's "scholar". 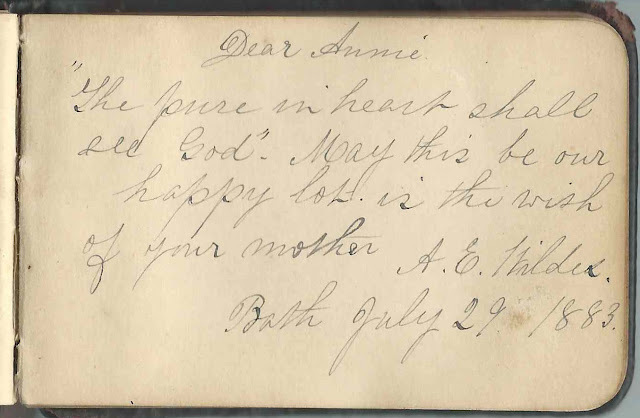 Annie was still a schoolteacher at the time of her February 1, 1893 marriage, at Bath, Maine, to blacksmith Lemuel Bradford Oliver, son of James H. and Patience R. (Spinney) Oliver. Lemuel was born at Phippsburg, Maine, on January 2, 1867. Annie and Lemuel had at least one child, a daughter Bernice Wildes Oliver. Annie died in 1925, and Lemuel in 1926. 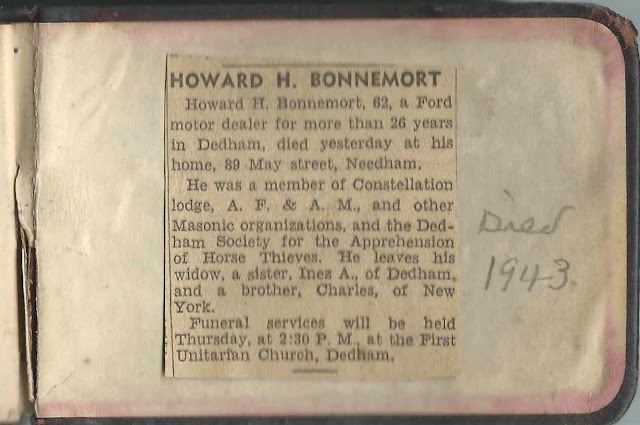 The inside back cover has an obituary pasted on it, that of Howard Holmes Bonnemort of Dedham, Massachusetts, who died there in 1943 when he was 64 years old. Joshua Bartlett of South Thomaston, Maine, signed at Pensacola, Florida, on March 4, 1883, on the Schooner Ada F. Whitney". The Ada F. Whitney would be wrecked off North Carolina on September 22, 1885, but the crew was saved. 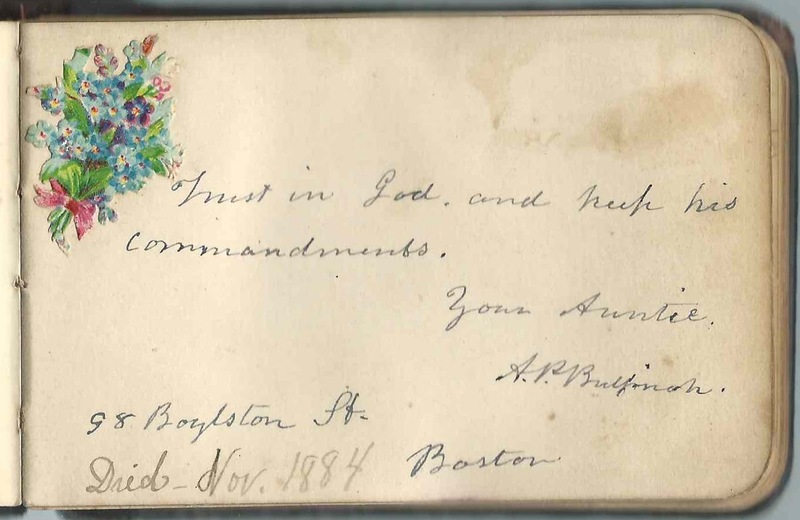 His wife Abbie S. (Emery) Bartlett signed the right facing page. Abbie S. Bartlett of South Thomaston, Maine, signed at Pensacola, Florida, on March 4, 1883. She was Abbie S. (Emery) Bartlett, whose husband Joshua Bartlett signed the left facing page. Walter H. Berry of Riggsville, Maine, signed on December 9, 1886. Also has the names Bess and Clarance. Obituary for Howard Holmes Bonnemort, who died in 1943 at age 64 at Dedham, Massachusetts. His wife was Dorothy (Morse) Bonnemort, born, I think, in Nova Scotia about 1881. "Your Auntie" A. P. Bulfinch of 98 Boylston Street, Boston, Massachusetts. She was Anna P. (Bowker) Bulfinch, the aunt of Anna B. Wildes' mother Ann Eliza (Bowker) Wildes and the second wife of Francis Vaughan Bulfinch. Later note: "Died Nov. 1884"
Wilton S. Campbell of Georgetown, Maine, signed on November 24, 1886. "David", perhaps the name of a vessel? 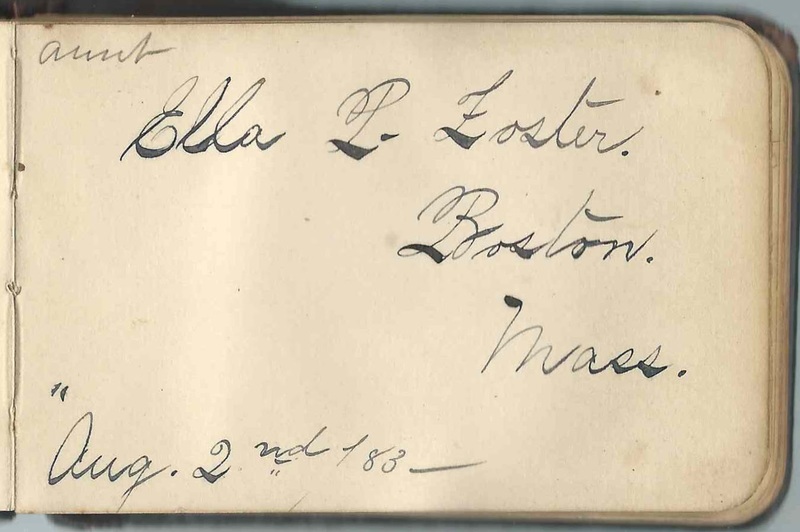 Aunt Ella P. Foster of Boston, Massachusetts, signed on August 2, 1883. Ella Jane Porter Bowker married Daniel Kellogg Foster. Information from the facing page: Information about the facing page. "Alonzo's Aunt Ella Bowker Foster opposite. Alonzo lived with her after his father was drowned for a while. I think he was about 15 years old. Later he returned to Bath, Me to be with his mother." Captain Paul Hansen of Machias, Maine, on the Bark Lepanto, signed on March 3, 1883. His wife Mary J. (Hatt) Hansen signed the right facing page. Mary J. Hanson on the Bark Lepanto of Machias, Maine, signed on March 3, 1883. She was Mary J. (Hatt) Hansen, wife of Capt. Paul Hansen, who signed the left facing page, and daughter of David and Grace (Barstow) Hatt. Paul died in 1888. 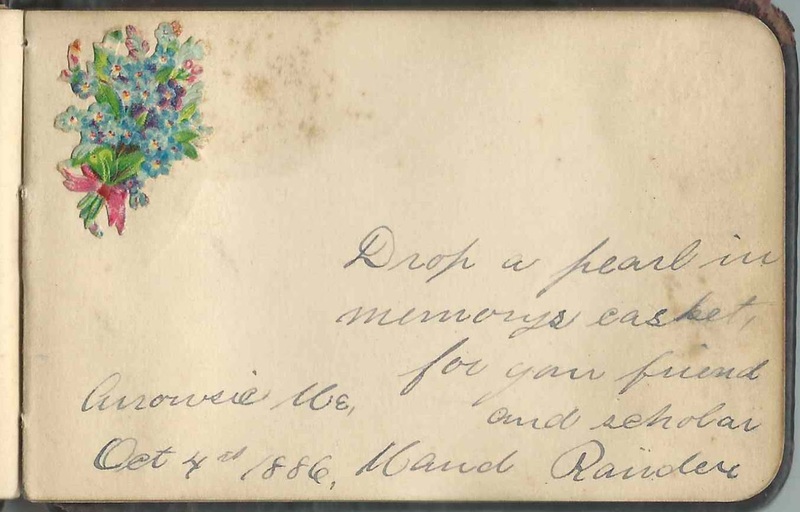 Mary married George Barstow of Machias on November 9, 1892. Jeremiah B. Pinkham of West Harpswell, Maine, signed on February 27, 1883. Jeremiah Bartlett Pinkham, son of signer Jacob Bailey Pinkham. Maud Rairdon, signed at Arrowsic, Maine, on October 4, 1886; "your scholar". 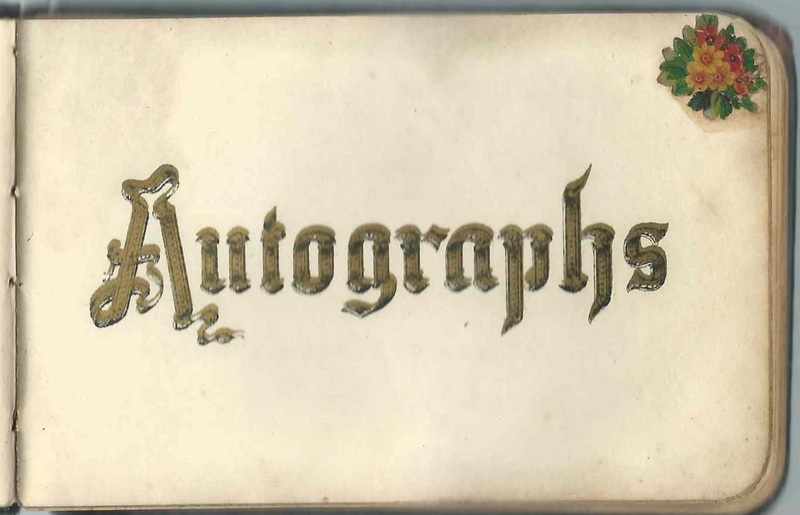 W. O. Rogers of Belgrade, Maine, signed at Bath, Maine, on August 22, 1883. Presumably William O. Rogers, brother of signers Carrie L. Rogers and Emery W. Rogers. Emery W. Rogers of Belgrade, Maine, signed on September 1, 1883. Brother of signers W. O. Rogers and Carrie L. Rogers. Mary Smith, or May Smith signed at Arrowsic, Maine, on October 12, 1886. Middle initial might be R or K or ? George G. Trafton of Georgetown, signed on November 21, 1886. "Scud"; perhaps then name of his vessel. Annie B. Wildes, "Christmas 1882, From Papa, New York". "Sch. C. H. Haskell - N.Y". Schooner C. H. Haskell. Papa was Alonzo Parsons Wildes, husband of Ann Eliza (Bowker) Wildes. A. P. Wildes, signed at New York on December 2, 1882. He died in March 1886 after his schooner, the Charles H. Morse, collided with the S.S. Oregon of the Cunard Line, about 15 miles from New York City. He and his crew drowned. Because the schooner sank immediately, it was speculation that it was the Charles H. Morse because nothing was ever heard again from her. Alonzo Wildes of Bath, Maine, signed on August 6, 1881. If middle initial was P., this would have been Anna's father; if an F., it would have been her younger brother Alonzo Foster Wildes. I'm leaning toward the latter, who signed at least one other page, if not two. A. E. Wildes, signed at Bath, Maine, on July 29, 1883; "your mother". She was Ann Eliza (Bowker) Wildes. B. R. Wildes of Blair, Nebraska. Presumably Bradstreet R. Wildes, who moved from Maine to Nebraska. Older brother of Annie's father Alonzo Parsons Wildes. 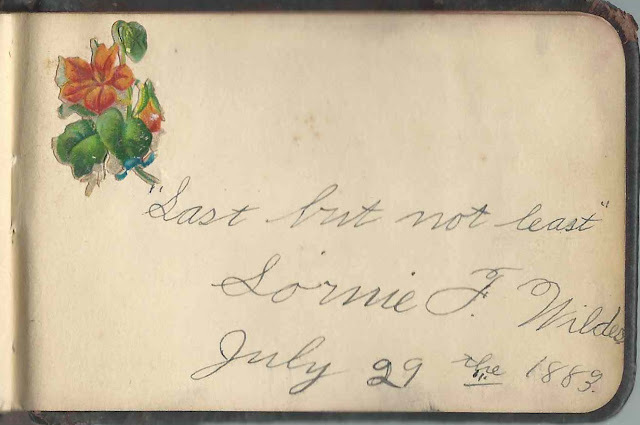 Lornie F. Wildes, signed on July 29, 1883. Presumably Anna's brother Alonzo F. Wildes. 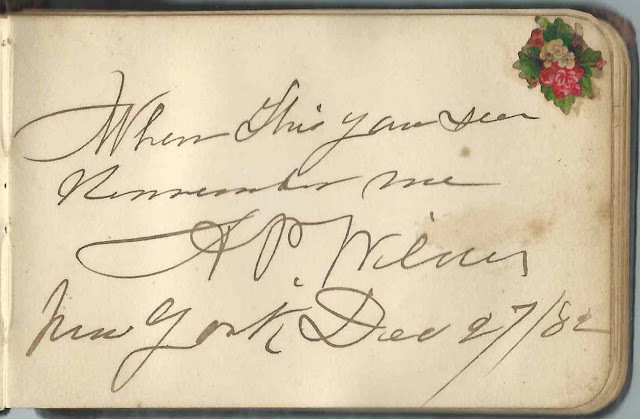 Robert Wiltbank, signed on March 9, 1883 aboard the Brig Daphne of Philadelphia while at Pensacola, Florida.